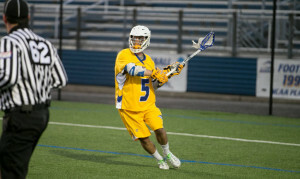 The Hofstra Pride men’s lacrosse team knew they were underdogs coming into Saturday’s matchup at Johnny Unitas Stadium in Towson, Maryland against the eighteenth-ranked Towson Tigers. Whether they were underdogs or heavy-favorites, the Pride accomplished a much-needed 9-2 win. Coach Seth Tierney recognized the leaders for their leadership during this week’s practice. The Pride’s season prior to this matchup has been quite a disappointment. They were only able to gain one victory out of the first five games and then go on a three-game losing streak in a crucial part of the schedule which featured CAA opponent Drexel. With eight losses, there is beyond a doubt that Hofstra will not be able to end the season with an even record, but this team needed to salvage whatever was left of the season, starting with Towson. Like most of the season, the strength for the Pride has been the offense, and that certainly was the case against Towson. Team leading-scorer Sam Llinares led the way for the Pride contributing an impressive four goals against Towson, bringing his total goals on the season to 32. Also carrying the load offensively was Korey Hendrickson and sophomore attacker Trevor Kupecky, both scoring two goals. Rounding out the scoring for Hofstra was Brier Davis, scoring his fourteenth goal on the season on an extra-man opportunity. The Towson Tigers’ offense shot the ball just as much as the Pride. Sophomore attacker Joe Seider, who leads the Tigers in goals with 26, managed to shoot the ball twelve times in this game. Unfortunately for him and the Tigers, 14 of their 29 shots, 16 of which were on goal, were stopped thanks to an impressive goalie performance by Jack Concannon and Chris Selva. Selva managed to find his way back into goal after Concannon was given the start in goal. He also started last week against Cornell, who scored on Concannon fourteen times. Concannon held the Tigers off the scoreboard for the entire first period before he broke his stick, forcing Tierney to put Selva back in goal. Selva didn’t disappoint in his second chance as he was able to hold the Tigers to two goals by making fourteen saves. Selva was humble in the post-game conference, suggesting that it was the defense that made his job a lot easier. With this win, the Pride improved to 5-8 on the season and 2-2 in CAA play, which is important as the CAA semifinals get closer. They will be given a chance to get one more conference win next Saturday as Hofstra travels to Fairfield, Connecticut to take on the Stags of Fairfield University in their final game of the regular season. That game will be played at 7 pm. As for the Towson Tigers, they drop to 9-4 on the season and their dreams of being perfect in conference play disappear with their first loss against a CAA opponent. The Tigers are tied for first with the Stags in the CAA. This loss will also affect their NCAA rankings. Their final game of the season will be at Vidas Field against the Dragons of Drexel University next Saturday at 1 pm.